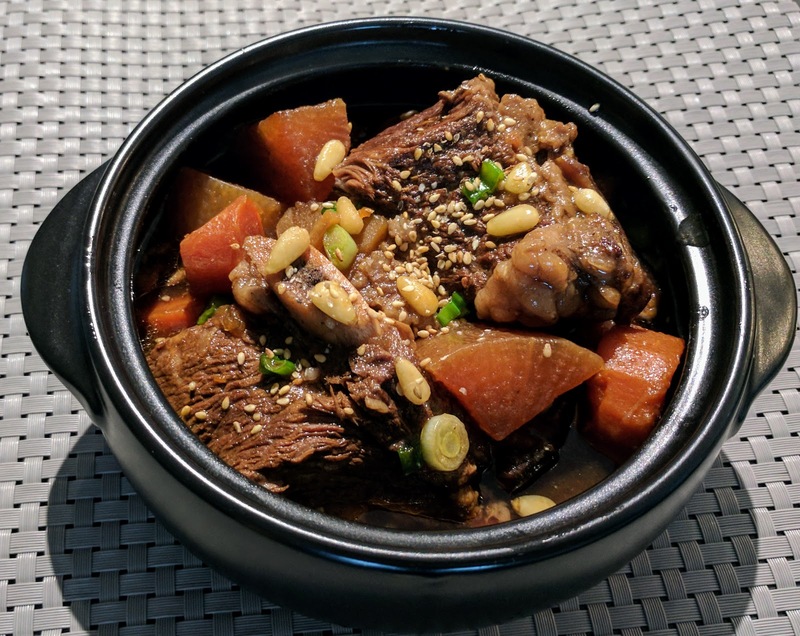 Braised Beef Short Rib Stew "Kalbi Jim"
Many people are familiar with or have had "kalbi" or Korean BBQ short ribs at a Korean BBQ restaurant. 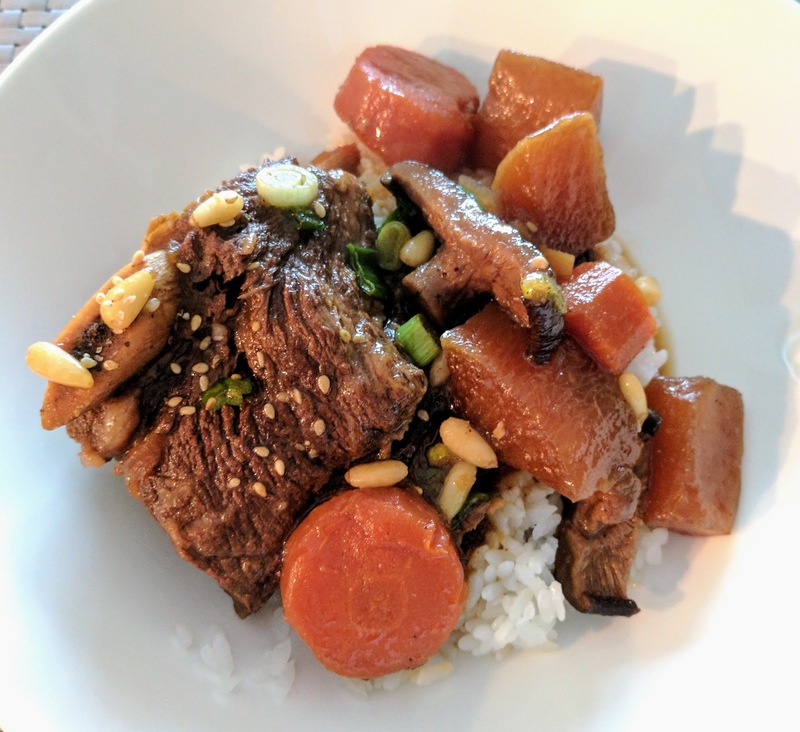 For me, I didn't discover "kalbi jim" (pronounce kalbi jeem) or Korean braised beef short rib stew until my mother-in-law made it for dinner several years ago - and boy was it delicious! It's beef ribs braised for 3 hours to create a tender, moist, fall-of-the-bone meat that is rich in flavours. 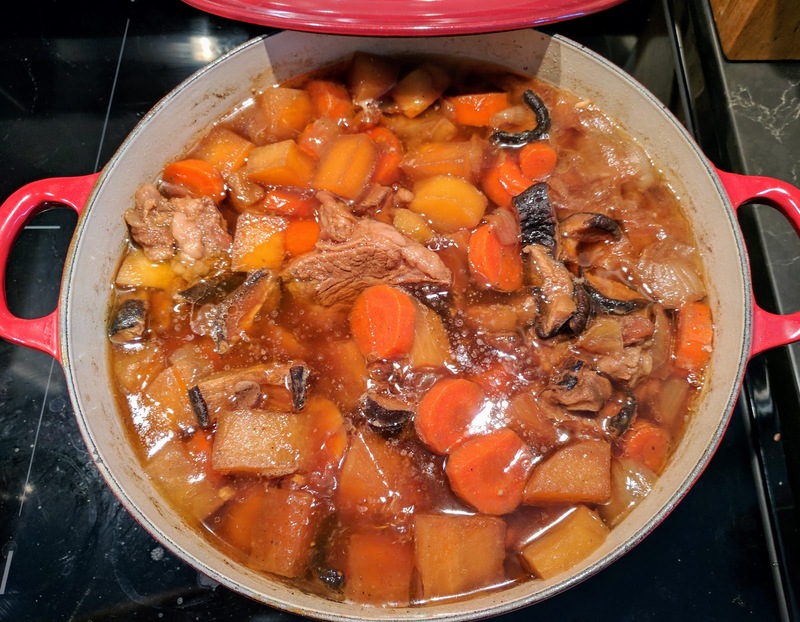 The carrots, daikon radish and potatoes are infused with the salty sweetness of the stew and combines to make an all-in-one comfort meal. 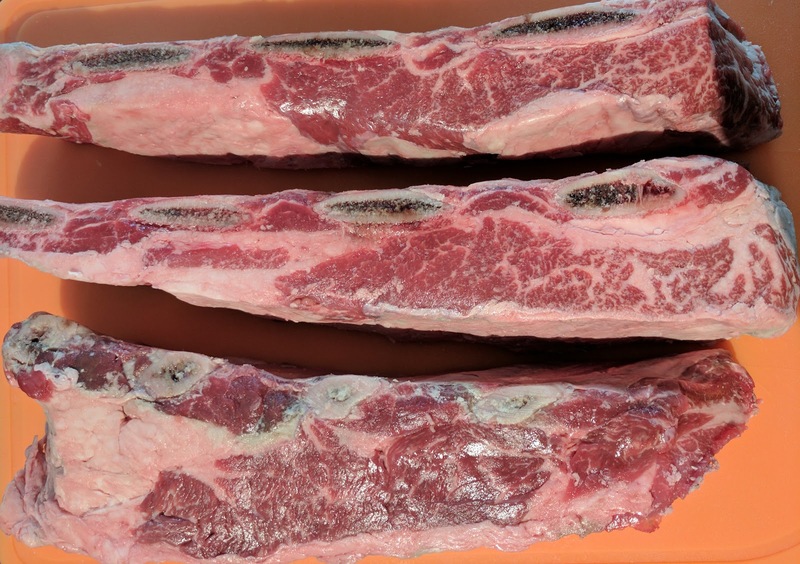 When you go to the butcher's for the beef short ribs, ask them for the flanken style cut and ask for them to be cut 2 inches wide. Flanken is typically 1 inch wide. If you are shopping at an Asian market, these should be readily available. Cut them into individual pieces. 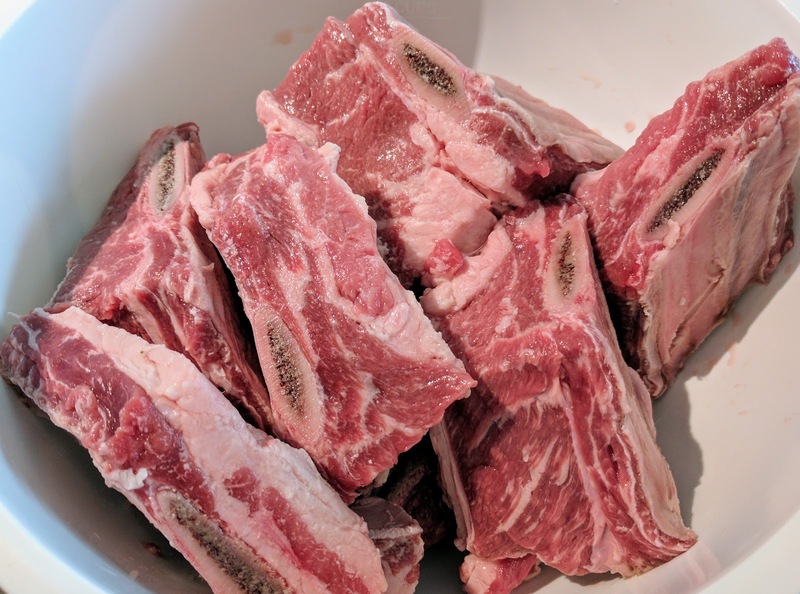 Trim excess fat and wash the ribs twice to remove the bits of bone and fatty pieces and then soak the ribs for 1 hour in cold water. Drain and wash one more time. In a blender, puree the garlic, 1 onion, pepper, sugar, mirin, sake, soy sauce, 1 tbsp ginger, apple and 1/3 of the daikon radish. Place the mixture in 3 cups of water in a large pot. Bring to boil and add the ribs. Mix together and add the mushrooms, 1 onion and sliced ginger. 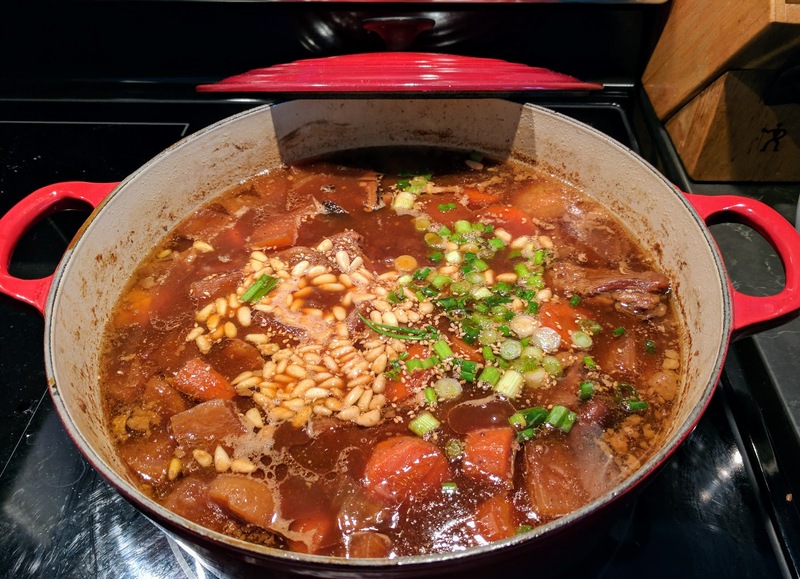 Once it comes to a boil, turn the heat down to low and simmer. After 2 hrs 15 min, add the carrots, radish and potatoes and cook for another 1 hr. Skim the fat from the top of the pot. Stir in pine nuts and green onions. Garnish with sesame seeds and serve over steam white or brown rice. You can store in airtight containers like these OXO snap containers in the freezer to enjoy later.